Before embarking on the process to choose any new optic let alone a mountain rifle scope it is paramount to establish exactly what it is for. Easiest way to do this is set hard feature and performance requirements so that you absolutely ensure your scope will achieve its role. The initial general premise was I wanted a scope that would spend the majority of its life being carried on backpack hunting trips into the Alpine chasing Sambar as well as across rolling hills and into thick gullies in the pursuit of Fallow. I’m also primarily a precision meat hunter that regularly utilises the turrets and reticles to take precise shots to fill freezers. The initial pass at making a spreadsheet to compare the options went easy enough and was mainly based on recommendations and what was in the cupboard. 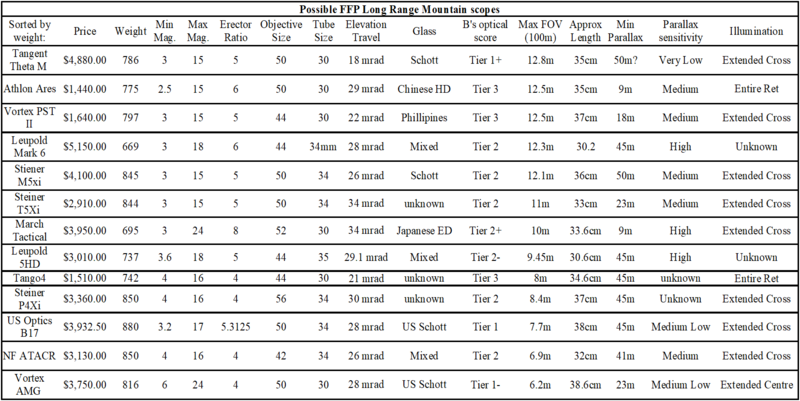 Check out the first focal plane scope spreadsheet here; Long Range Mountain Scope, this in turn resulted in heated debate with a few mates also looking at scopes for the same reasons. Then Brooky threw his spreadsheet into the mix (pretty sure his was under way before mine) and it got difficult. It was clear a more scientific approach was required to make the decision as there are a lot of really good options out there and it was nigh on impossible to seek them all out. Hence my previous advice, establish exactly what the scope is for! With this in mind I established a number of criteria that would help thin the number of scopes vying for my attention for my new mountain rifle build. Lets get this out the way before someone argues that second focal plane is better/all you need etc. 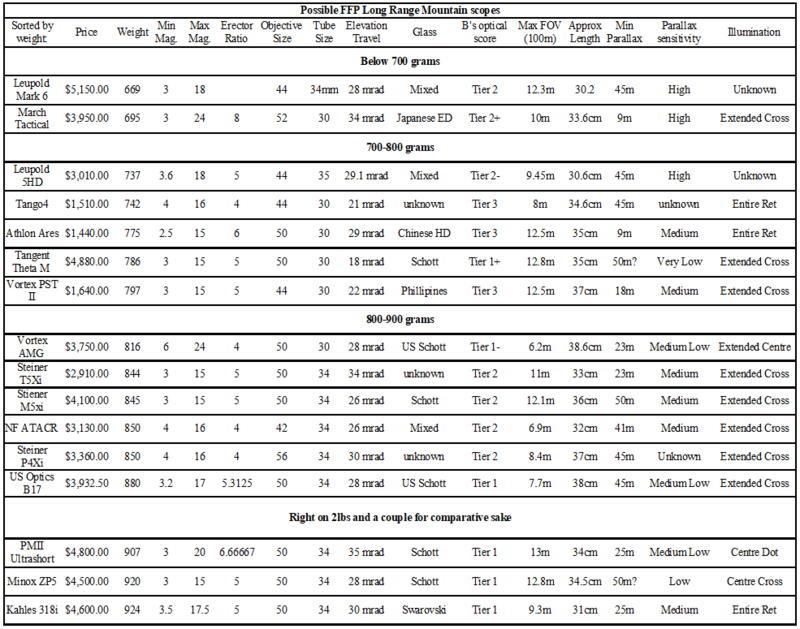 Now while I have shot more with second focal plane scopes than any other optical configuration, I have found I take my distance shots faster when I have a First Focal Plane (FFP) scope and when hunting, milliseconds count. FFP also allows for very precise holds at the longer distances at any magnification, critical when maximising field of view to ensure you can call your own shot as well as get back on target in the shortest time possible. Another key feature of FFP is being able to cross reference holds and dialled elevation/windage and even measure my target in Mils at any magnification, especially useful when evaluating if the shot is even possible with enough margin of error should the wind be at peak gust etc. Finally, if the target is close, I vastly prefer to be able to reduce all the sub tensions and markings by adjusting magnification until they are basically out the way and I am left with a simple almost Duplex ret, perfect for fast and sometimes off hand shots. If the scope is to be useful from stalking to long range shooting at targets of varying distances, then a mountain rifle scope with the reticle in the first focal plane is a must for us. I dial my turrets, in the modern era, if you dial your turrets for hunting applications where time is crucial, not having zero stop means you have to spend time looking at your scope to determine if it is on zero or not. With a zero stop you never have to look at the turret, you may simply count clicks, or spin back to zero and use the reticle for holdover. It is a vital feature for a mountain rifle scope. An illuminated ret can be the difference in last light scenarios. After hiking for a week, there’s nothing worse than on the final evening of hunting right at last light, being able to see your quarry through the binoculars and even through the scope, but being unable to determine the point of aim. Meaning you are unable to take the shot, sending you home empty handed over something as simple as not having an illuminated reticle. Rarely does illumination add significant enough weight for me to consider a scope without it, especially considering I spend most of my time hunting somewhat crepuscular critters. For me, 15x is all I’ve ever needed when hunting, even shooting beyond 1000m on steel I regularly find myself wound down to magnifications of 10x and 15x. While high magnification is nice to have, It isn’t crucial. I have a 4.5-30 Delta Stryker that spends the majority of its life on 10x, but being able to crank it to 30x is very nice indeed. I do however like having enough magnification to test loads accurately, true the the velocity for varying temperatures as well as collecting transonic data for a load. Because we have to draw the line somewhere and this scope will need to be carried for over a week on my back. Now, I know leupolds/swaro’s etc do ultralights that are around that 1lb mark, but as far as I’m aware none of them fit the other criteria so I was happy setting the scope weight a little higher than most would consider for a mountain rifle scope… in truth this was mainly because I wanted to include the Schmidt and Bender PMII Ultrashort 3-20 in the comparison as I regularly got advice that it was a fantastic long range/backpack hunting/mountain rifle scope. It’s at this point that I’ll add I included two more scopes in the comparison that went a touch over 2lbs, the Minox ZP5 315 and Kahles 318i. Again this was based on a whim as I got a number of people telling me they were great scopes that would satisfy my glass quality requirements and would be ‘perfect’. These scopes were removed at the first comparison point when comparing weight. When hunting, field of view is vital. It gets you on target faster and allows you to have more awareness of what is going on. Sure you can crank the magnification if required for the shot but when hunting the alpine or timbered fringe country having a field of view that gets you on target faster is vital. Too often have I heard someone i’m guiding onto an animal say ‘I can’t see it’, this isn’t due to camouflage or anything other than them having insufficient field of view to locate the animal. A field of View (FOV) of 10m at 100m is 32feet, which is conveniently the distance between two posts along an average fence line. Unfortunately this criteria knocked a number of scopes off my list that are regularly recommended for mountain rifles, eg: Tango 4, Vortex AMG, NF ATACR, STeiner P4Xi, USO B17 and the Kahles 318i. I have left them in the comparison initially as can be seen in the table but after sorting my shortlist by weight I sorted by field of view and removed them. However, with the rising prices of red meat, a few hundred kilograms of extra venison can make even the most expensive scope worthwhile. For example, one Sambar hind can yield upwards of 50kg (stags can yield twice this amount or more) Current venison prices (for low end cuts) is $20/kg, so even neglecting the increased values of the more premium cuts, one Sambar is worth upwards of $1000 in value. With this in mind I argue that features and meeting the criteria set is more important than the sticker price. If a particular mountain rifle scope results in more venison in the freezer then it is more valuable to the hunter than a scope that results in a missed shot, a failure to take a shot or worst of all, a wounded animal. This is what we alluded to earlier… that moment when all these scopes recommended to us as ideal mountain rifle scopes show their weakest link. It really is a feature commonly overlooked and regularly to the detriment of the hunter. The better your field of view the faster you will get on target, giving you more time to take a shot, also greater FOV allows you to track the target better after the shot. It is that simple. So with an absolute minimum FOV being 10m at minimum magnification, we now say goodbye to; Leupold 5HD, Tango 4, Steiner P4xi, US Optics B17, NF ATACR and the Vortex AMG. The main reason for this drastic measure simply comes down to minimum magnification, to achieve better field of view lower magnification is required at the weight limitation (larger field of view could be achieved by increasing tube diameter like in the 40mm IOR’s but the weight sky rockets excluding them from the running). We re-sorted the survivors by weight again and then triggered another argument about weight, While we initially decided anything under 2lb would be fine, there are only 3 main weight brackets remaining; At the lightest end of the scale was the the highly engineered Leupold Mark 6 and March 3-24×52 at under 1.54lbs/700grams. Next up are the entry level scopes (Vortex PST II 3-15 and Athlon Ares 2.5-15) and the best glass we’ve ever looked through in the Tangent Theta 315M in the 775-800 grams (1.7-1.76lbs) range. With a final step to the 2 Steiners at 1.86lbs/845grams which comparing them hard, the Steiner T5Xi really looks like a better proposition, optically comparing them side by side there really isn’t enough in it between the T5 and M5 to place their optical score on different tiers for my eyes, I really did struggle to see the price vs optical quality justification between the T and M steiner series, glass quality is subjective to the user however so this is all very much an opinion based point. So we argued and argued if under 1.8lbs/816grams was the best place for the cutoff. First off, (ignoring the Leupold -we will come back to that one) the two weight groups that remain are differentiated by tube size, and if you go with a 34mm tube scope on a mountain rifle, you have a snowball effect on weight increase over the 30mm tube options. Scope is heavier for one, then the rings are larger and heavier and will need to be taller. If the scope ocular is further away then you run the risk of requiring an adjustable cheek piece, which in turn increases weight. Weighing up the choice between a 34mm and 30mm, I’d recommend a 30mm scope on a dedicated mountain hunting rifle every time. So I’m comfortable dropping the Steiners out of contention for what I believe makes a rifle scope a ‘mountain rifle scope’. Wait a minute, parallax sensitivity, we forgot to eliminate scopes with high parallax sensitivity! I Have many hours behind a March 3-24 (admitting it was only the 3-24×44 non illuminated) and it had a significantly sensitive parallax adjustment. It had an amazing erector ratio but the price paid was sensitive parallax and thankfully a mate was good enough to purchase a 3-24×52 and while a little bit better, it still had highly sensitive parallax, from these experiences I can say with confidence that when hunting, sensitive parallax is less than ideal and can become a time sink that you cannot afford. Scopes like the old Premier and current Tangent Thetas are hailed as the kings in this regard with parallax free optics from around that 300m (premier) and an amazing 230m (Tangent Theta) mark, meaning a hunter only needs to worry about parallax for the closer stalking distances, an easy solution, set parallax for 100m in timber and 50m in really thick stuff. Now at this point a friend of mine made it very clear that his Leupold Mark 6 (non illuminated however) was significantly less sensitive than the March, I countered that it was still high, not as high, but still high. 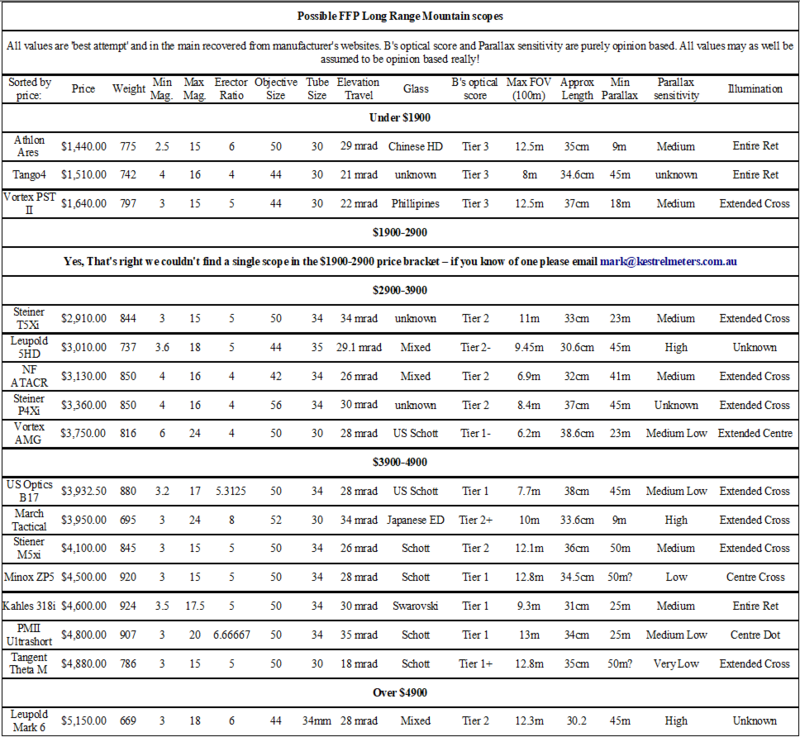 Plus the elephant in the room when it comes to Leupold is they regularly do poorly in tracking tests. Put simply, my mates Mark 6 has turrets he never touches, it is a set and forget scope… for me to spend $5000+ and not be able to dial precisely is just not worth the risk. I’ll take higher sensitivity with fantastic turrets over poor tracking anytime and considering we were eliminating the March, the Leupold Mark 6 went off my list as well. This left 3 scopes… 3! one tier one, top of the line scope and 2 budget scopes! The two budget scopes are similar across the board, personally when it comes to the PST g2 vs Ares argument I normally give this advice. For the lower magnification choices, 2.5-15×50 Ares vs 3-15×44 PST gen2 I recommend the Ares, it is slightly lighter and more compact and with the larger objective does better in poor light situations. It also makes a phenomenal rimfire scope (see details of why its so great here) so when one moves to the top tier the Athlon ares is perfectly at home on a sweet rimfire trainer or PRC/NRL22 competition rifle. Having said that, if you are one that craves more magnification then the glass quality of the PST gen2 5-25 shines above the Ares 4.5-27 and we generally nudge people towards the PST gen2 in that regard, neither are what I would classify as mountain rifle scopes however! But, quality glass can make a shot possible as well as having a significantly more reliable optic can make all the difference when things go wrong. Enter our choice as the winner…. 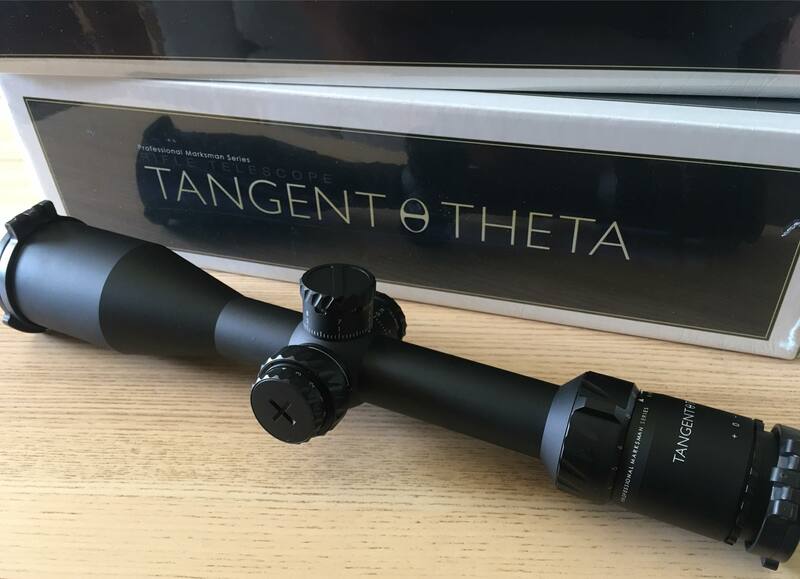 Tangent Theta 315M – the ultimate precision mountain rifle scope. When I first looked at which scopes met all the criteria so far, I was shocked. 2 upper entry level scopes and one of the best scopes money could buy. With over a $3000 price differential the Athlon and Vortex look like exceptional value for money for an entry level mountain rifle where dialing/ffp is required. It would appear to get a better scope optically without spending twice the money the only real option is to remove the FFP criteria. I however really do believe the perfect Mountain rifle scope is a FFP scope. I also truly believe in buying a scope that is fit for purpose, and looking after the entry level ones if the upper tier is out of reach. I already own a Athlon ares 2.5-15 and while it is a fantastic scope on my .22LR, like the vortex, I never want to use their lifetime warranties, no matter how good they are when I am mid hunt. So I really look after my scopes and do ‘worry’ about them when in the field, too often I hear about people abusing their entry level optic and then babying a tier one optic, it may be counter intuitive but generally the more you spend, the less you have to worry about it when it comes to rifle scopes. I am admitting being a ‘glass snob’ as well and it should be pointed out that the Tangent Theta is not only incredibly robust and guaranteed to out last the owner in terms of mechanical reliability, it is also jaw on the floor good optically. It has everything I was looking for in a mountain rifle scope… dare I say it, it could well be the ultimate mountain rifle scope and its for these reasons above that we worked so hard to start bringing the TT315M’s into Australia. However the Tangent Theta is tier one expensive and if you are getting into backpack hunting and want a FFP then I suggest saving money and getting one of the fantastic Athlon Ares 2.5-15×50 scopes, negate a chunk of your grocery bill long enough by bringing home prime venison and save until you can afford the Tangent Theta 315M. Move the Athlon to your 22 training rifle and then harvest even more with your TT315M… well… atleast that’s what I did after moving on from my March…..